I'd been waiting for it for months: the semi-annual $1 sale at one of my favorite stores, Avalon Exchange. My mom even had it on her calendar, planning to watch Ruby so I could actually shop. When D-Day (aka Dollar Day) arrived, Ruby giggled her way through my parents' house while Brian and I had a rare, delicious day date. We munched on fried bologna at Salt & Smoke and hit the sale. There were only a few racks of stuff for $1, so I devised a strategy: stalk the salespeople. I perused the racks, found a couple of cute items, then not-so-inconspicuously waited until they restocked the shelves. My efforts garnered an awesome pair of clogs, a band tee highlighting one of my favorite movies (The Langoliers), a pair of pink jeans, and a sweater with a heart pattern. Brian found some orange corduroy cutoffs that he's worn the rest of the summer and a couple of tees. Eventually, the best sale items dwindled, so we joined the long line of deal-hunters at the register. And then I saw them coming towards me: white lace-up boots. I'd been saving up for some white Docs! Seconds after the salesperson put them in the $1 section, I confirmed that the boots were my size and scooped them up. My triumphant grin froze when Brian made an odd remark about my new boots. "You know those are ice skating boots, right?" Gulp. I actually hadn't noticed, but the "large" written on the tongue was highly suspect. There were no blades on them, yet they did look a lot like ice skating boots. Oops. "Well," I rushed to the boots' defense, "they're still white boots. 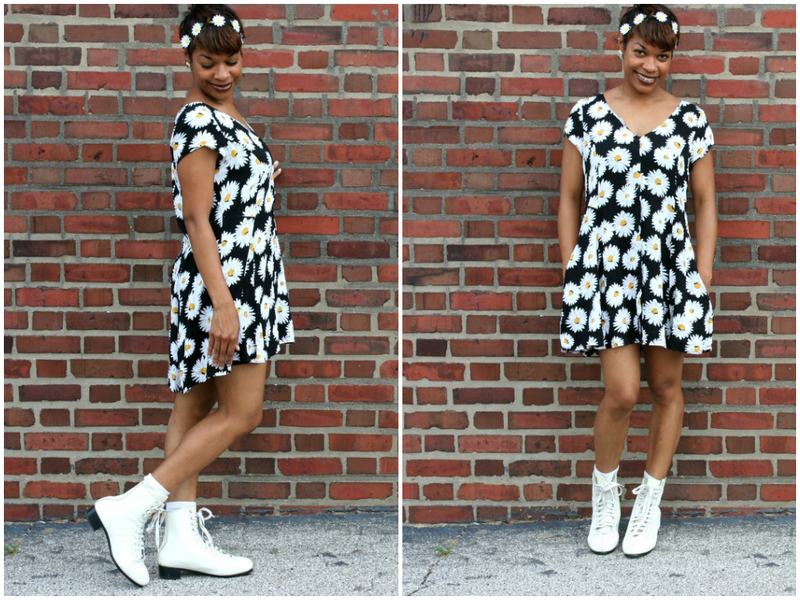 I've been wanting some white combat boots, and these work. Besides, no one will notice from a distance," I sounded way more confident than I felt. "I can't believe you're getting ice skating boots! I mean, ice skating boots?" Brian scoffed. "But, they're just a buck, so you do what you want." He saw that his commentary (as if often does when he dares question a wacky fashion choice) made me even more determined to rock my ice skates. "If anyone can pull these off, you can," he conceded sweetly. I smiled again, ideas for outfits already skating through my head. 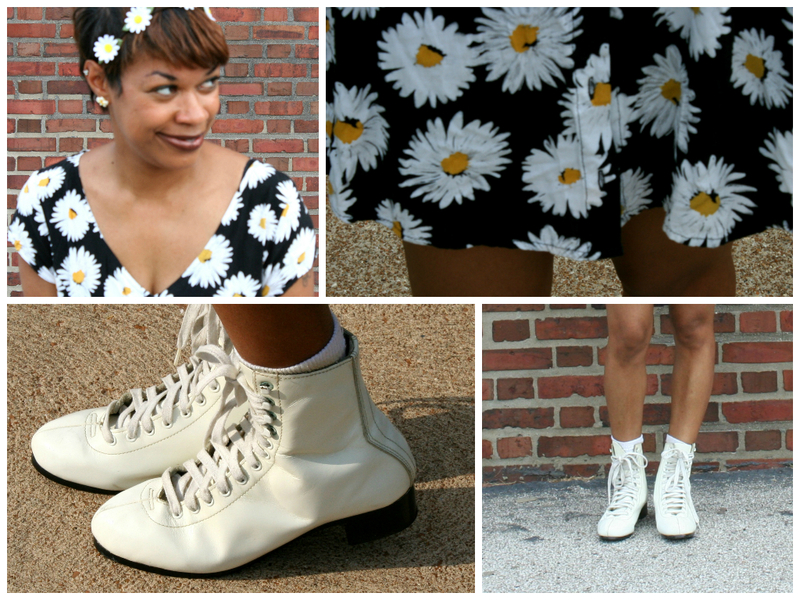 The boots are a perfect partner for my new-to-me 90s daisy dress, also found at the infamous sale, although not on the $1 racks. I figure my boots are a win either way - if people don't notice that they're bladeless skates, cool. If people do notice, they'll be impressed by my moxy in wearing them like normal shoes. Works for me! A daisy headband and a daisy dress is so matchy-matchy that I had to do it. I've officially unleashed my inner ice skating diva. Skating rinks, be warned.